For many of us, photos are the reason to scrapbook and multi-photo scrapbook pages let us pack in lots of memories. While we’ve heard (and even sometimes agree) that one or two photos with strong journaling are as powerful as a dozen photos–still, there are times that we want ALL those photos. We want as many shots as possible filling in the details of the day. See our creative team’s favorite approaches for making pages packed with photos. Stefanie Semple never goes out without her hair done and made this page when she saw the journaling card with the perfect quote about hair for her story. # Selfie by Kristy T | Supplies: Paper: Heidi Swapp; Cardstock: Bazzill; Stickers: Echo park; Pen: Artline: Tag: Kaisercraft. A sketch and layered template for this design are a part of the Get It Scrapped membership library of 150+ sketches and templates. Click here to join. Amy says, “I packed the page with photos of the Taj Mahal, the entrance, the exterior, close up of the marble and its inlay with semi precious stones. I concentrated on showing the photos and minimizing embellishment.” Her design of a blended background photos and layered photo-booth strips lets her incorporate so many photos. “When I make a photo-packed page, I use fewer elements and solid page backgrounds. This creates less clutter and lets me convey a clear idea what the photos’ story is.” Summer’s composition is one with many small photos showing the details of the trip and generous white space. 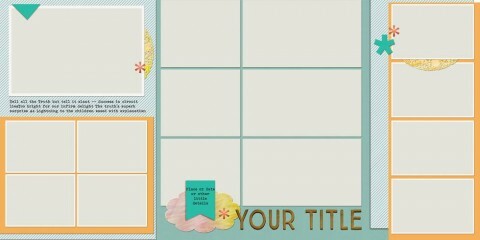 Understanding the options for combining photos on the page always speeds up the work of scrapbooking. The Get It Scrapped Membership includes 21 Scrapbook Coach classes with 80 15-minute video lessons that foucs on choosing and mixing photos as well as patterns and color using tried page foundations. Check it out along with a goodie-packed video on the topic when you click here.